I wasn’t prepared for flea market day on Saturday on my end, but I did go see what my neighbors had for sale — well, at least the ones inside at the time. Joey wouldn’t sell me the only thing I was interested in, his gyroid. 😦 Twisk looks angry! You can see a bit of evidence of my work towards getting the golden slingshot with that present on the ground there. 😛 I’m experimenting with leaving them on the ground for decorative purposes. At least I managed to get a decent picture of the wahoo moment. 😆 But there are still a few foggy reflections from the sunlight streaming in, actually. Sunday was a quiet day of watering flowers and buying turnips from Joan, and Crazy Redd came as usual on Monday. Ahh, she almost said what she guessed, but then caught herself! It wasn’t necessary, but of course I got one with each of my characters. 🙄 Don’t hesitate to ask for one, if you want! I even have some golden watering cans saved from my previous town. Over in Red Bank, I made some quick patterns for Jemma’s contest of a festive town hall! Haha! I’ve never heard any of my neighbors reference the backflips before. 😆 That made me smile. Not if I put it in my dresser. 😛 I have no room on my tables at the moment, sorry Curt! 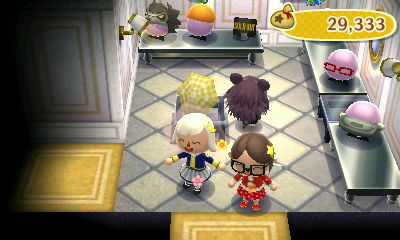 Monday was a pretty day: there was a spotlight item as well (a plum bonsai), and I found Phyllis at the Roost! Today, on the other hand, was relatively quiet, besides Gracie stopping by. Posted on September 6, 2011 by Amy •	This entry was posted in AC:WW, Dafdilly and tagged Animal Crossing. Bookmark the permalink. Aww, I will! 😛 Yeah, it’s an unfortunate situation for all three of them… I can’t help but feel bad for Pelly a bit. And that reminds me, I’ve hardly scratched the surface of the Red Turnip Trade. I was satisfied with getting my golden axe when I did and promptly forgot about the rest. Thanks! I agree with that asessment, and the golden axe is really useful too since you don’t have to stock up on regular axes anymore. I have to wait for Tortimer to show up before I can get it (hopefully I won’t forget >_<) — the next time will be a bug-off, I think? Maybe Pelly’s, hers isn’t quite as costly to get! xP haha, that’s great! 😆 I guess the next time Saharah comes you could try and use it to get the red vase! Well I already gave you credit for it and I hope I don’t forget again XD Silly me! Same to you, if you want to use any of my pictures for any more guides. 😛 I don’t know how many would be useful, but I think I have a few pictures of different house expansions and the major buildings. My favorite is probably Nookington’s because it looks so posh and the selection is the best. 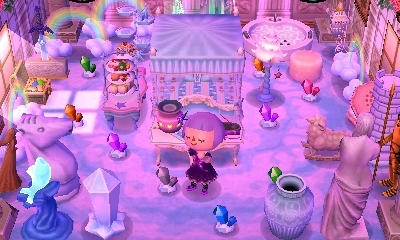 🙂 I love how many flowers are sold each day in Nookington’s (I usually buy them all everyday :P) and I get frustrated with how few flowers there are in the previous stores. 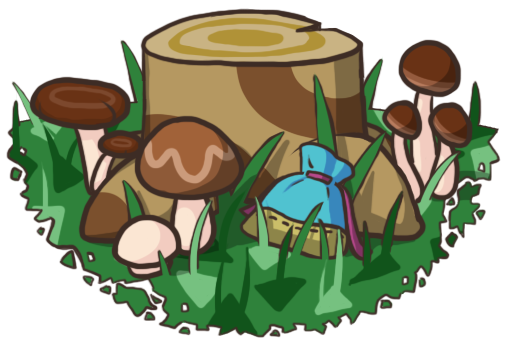 My second favorite is Nook’s Cranny; the name is the wittiest and it’s so small and charming and has a door chime like the Able Sisters. The decorations in Nook’s Cranny are nice, too, and not commercial like the expansions. The ones in between are fairly meh to me compared to those two, especially Nook’n’Go, but I like Nookway a fair amount.